Now I got this 25g tube as part of a gift set for Christmas and usually I detest hand cream. I'm really no good with moisturiser as a whole, I hate the feeling but I'm trying to help my skin these days so I've managed to use this whole tube in a month. I had this one sitting on my desk in work and the other girls loved the smell of it too. It's a very light citrus fragrance which is ideal for me and it sinks into the skin super quick. I'd totally recommend this to anyone, like myself who would struggle to use hand cream. Luckily the set I got this in, has another tube of the same so I'm set for another month. I previous years I'd shy away from any products with cinnamon in, it's not that I don't like it but usually the scent is very overpowering. But not this. This shower/ bath gel is amazing! Just the right amount of cinnamon goes into this product. It's perfect for creating a giant bubble bath and I've spent many nights laying in the tub for hours thanks to it. I don't find it any great skin benefits from this product but it really is ideal on a cold winters night to soak in a slightly spiced scented bubble bath or wake you up first thing in the shower. Certainly one of my favourite products from the last few months. It's listed as being "special edition" on the "Treacle Moon" site but has apparently been available since 2012 as a Tesco exclusive. I'll certainly be buying more once my second bottle is done. I purchased this when it was a 1/3 off so it was only £1.99 in Tesco before Christmas. Now this is one I WISH I had a full size product of but at a back-breaking £150 for a full sized tub, I'll just keep on dreaming. I've been working my way through my old Glossybox products and trying to find something to help my (terribly dehydrated) skin. This one certainly did just what I wanted. I only managed about 5 applications from this tester but I loved it, I LOOOVVEEED IT so much. The Rodial site boasts all the usual info on the product, it "plumps" and "smoothes" and "promotes skin elasticity" etc but all I care about is that it made my skin feel GREAT. It absorbed into my skin quickly and the smell with minimal. A serious winner. This sample size came in the lovely Harvey Nichols special edition box my other half got as part of my Christmas gift. As mentioned above, I'm terrible at using moisturiser but during a trip to Illamasqua one day for a mini make over, the MUA suggested I upped my skincare regime as my skin was so dehydrated. So I popped over to see a friend at the Philosophy counter and she suggested this. I really liked that this had barely no fragrance to it and it make my skin feel super hydrated without being greasy. At almost £35, this was a bit of an investment for me, I was always a £8 tube of Aveeno kind of girl, but I'm so glad I followed advice and purchased this. Philosophy regularly do money off promotions or buy two products and get a whole bunch of free gifts so the price tag doesn't seem quite as bad when you walk away with lots of extra goodies AND Debenhams Beauty Points too . This pot lasted me around 2 and a half months but if I'd be using it properly, day and night, it would probably last around 2 months max. Now this is a product I've been using for at least 7 years, maybe even longer. I love a good scrub to get away all the yucky dead skin cells and this one is the only one I've ever repurchased. The exfoliants are a bit larger than most scrubs and some might then find it a bit too rough for their skin. personally I love the stuff. I've used the other products in the range but always come back to the blemish control one, as even at 31 years old, I still suffer from bad break outs and uneven skintone. This product is certainly a staple for me. Superdrug is the cheapest place I've found this one. Sometimes Tesco do it 2 for £5 so I'd stock up. As mentioned above, I'm trying to work my way through all my sample products and I aim to sort out my dressing room in the next few weeks so hopefully I'll have a few more product empties in the next few weeks to share. Have you tried any of these products? Or have you a mountain of almost empty goodies at home just like me? 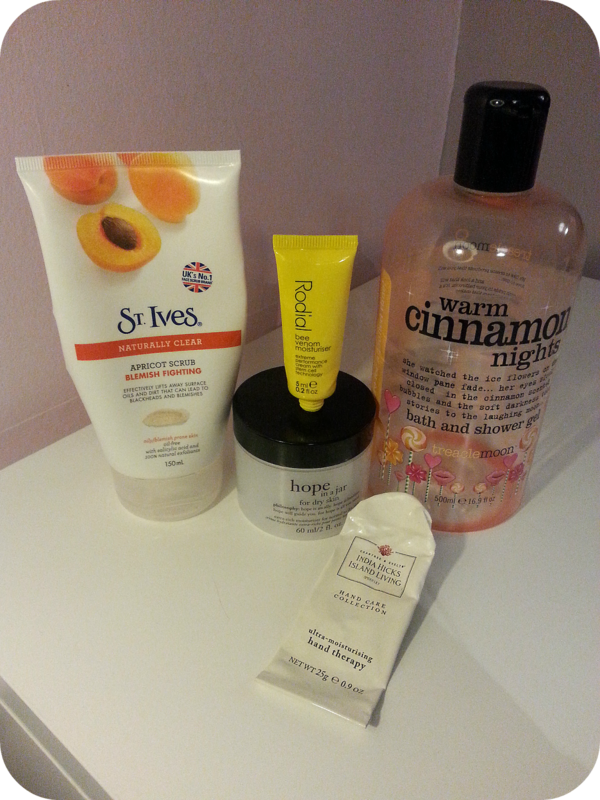 I absolutely love the st ives apricot scrub!